Hello weekend! This weekend we have plans to start decorating our home for Christmas – yes, I said it. We are decorating our home for the holidays I couldn’t be happier!! It’s never too early to start celebrating! Ok, I digress..Last week we spent a lovely weekend at the amazing Red Mountain Resort in St. George, UT as part of our trip to Zion National Park. We searched for the perfect place to kick up our hiking boots between excursions! 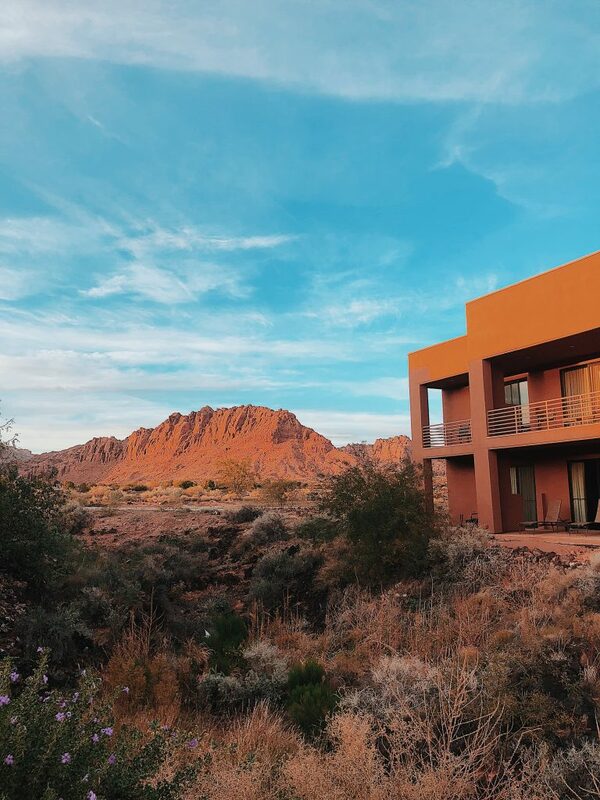 Today I’m sharing our review on Red Mountain Resort and trip tips to Zion National Park – it’s an easy getaway that will give you the recharge you need! We planned this trip at the last minute as Brian had been asked to go to a convention in Las Vegas for work. When these moments happen, we try to take advantage of being able to travel somewhere new and unique. Seeing Zion National Park has been on our list for some time, but traveling from Chicago, we could never make it work. 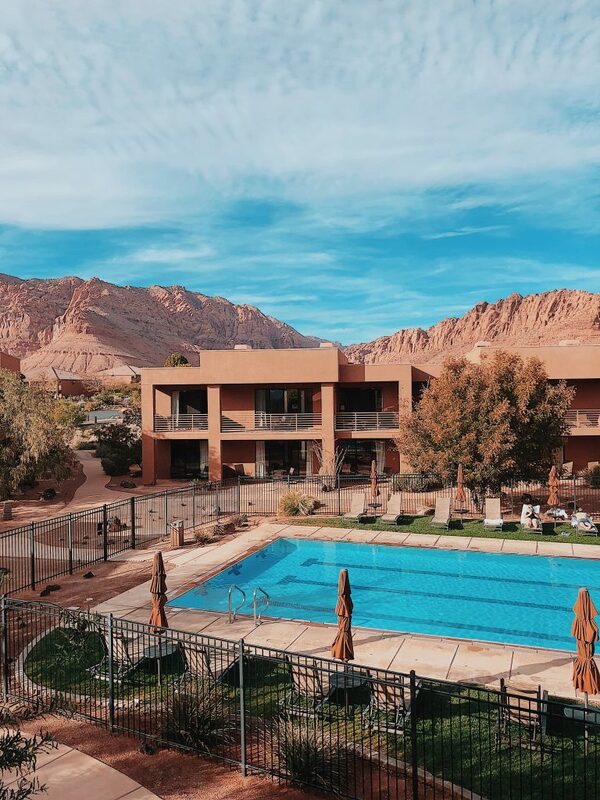 The Red Mountain Resort was the first place I found when searching for resorts in the area – we wanted something relatively close to Vegas (since we flew in and out of there), but also something close to Zion National Park (1 hour from the park). Red Mountain Resort checked all those boxes! After a quick two hour drive from Las Vegas, we arrived to the Red Mountain Resort. Our trip started at the customer office where we checked in for the weekend. After we checked in, we were set-up with their convenient texting system – it’s a 24 / 7 concierge service! Genius! We stayed in their King Villa and it did not disappoint – we had so much space and two bathrooms….which we know is the key survival element to any marriage 🙂 While we didn’t spend too much time in the room since we were traveling to and from the park, it was still the coziest place to come back to! Our Villa was located next to a gorgeous heated pool / hot tub and walking distance to Canyon Breeze – where all the meals are served. MY FAVORITE element of the resort were the meals! When you book your stay with the Essential Package, all your meals are baked in to your resort fee! Every morning we walked to have breakfast before we headed out for the day. On Saturday, the day we went to Zion National Park, they even packed us a lunch knowing we wouldn’t be back before then. A little detail like that makes such a difference in your stay! We hiked 9 miles that day through the Narrows with no access to food, so having our lunch prearranged was perfect! After our long days, it was really nice to be able to to walk to dinner and enjoy a glass of wine. Each night from 6 – 8pm on the weekends, they had live music to accompany our dinner – it was perfect! Dinner is served in three courses – soup / salad, entree and dessert. The Red Mountain Resort is a wellness resort – all meals are designed and portioned to be as healthy as possible! AND we were able to book all our dinner reservations through the convenient concierge texting service! The resort is not short of any activities – in fact they have a daily calendar of over 30 activities from workouts, to mornings hikes, to drum circles and acupuncture! Most activities are free, but there are a few that have a fee associated with them. 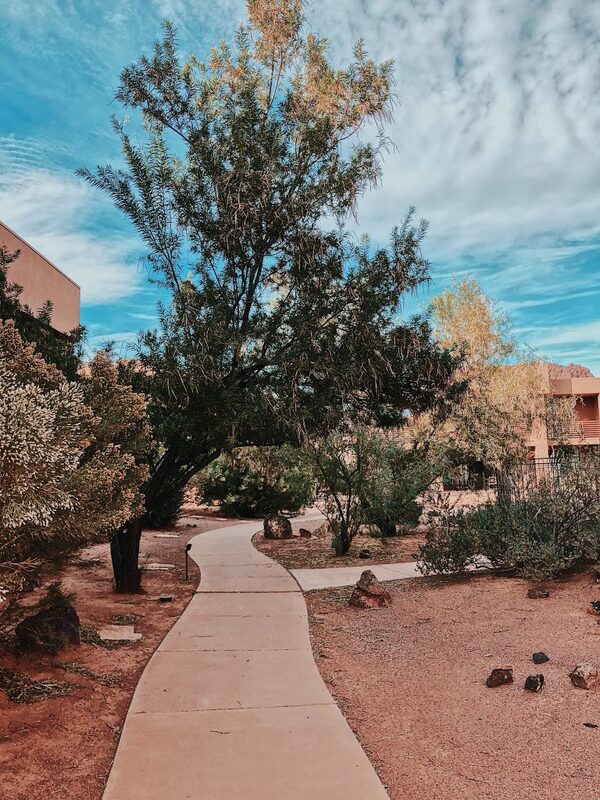 Every morning the resort organizes a guided 2 hour hike – if you go and don’t plan on leaving the resort, this is a must and gives you the opportunity to experience a nearby park! The day we arrived, we signed out a few bikes (for free) to check out the resort and the surrounding area – it was blast and a great way to see everything! 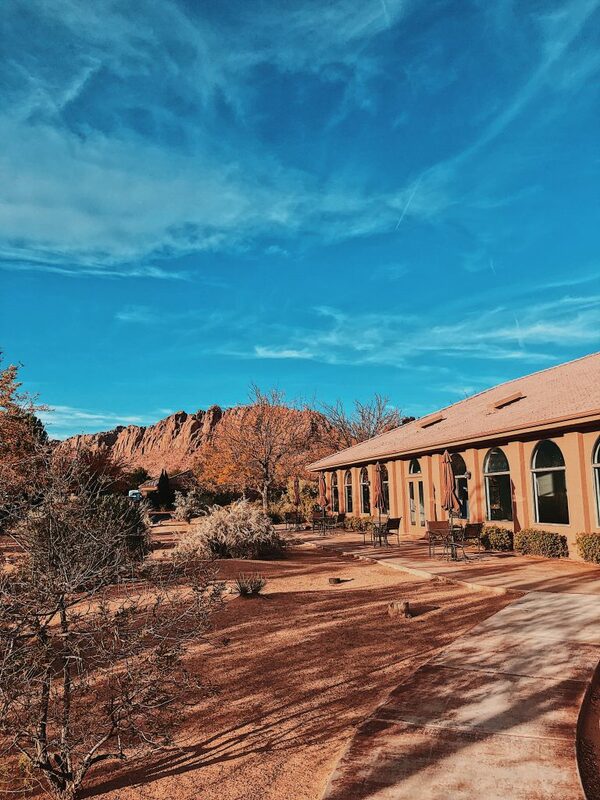 Red Mountain Resort is home to an award winning spa that sits in the middle of the resort. Sadly, we didn’t have time to take advantage of any of the services, but the spa amenities are open to all guests for free! 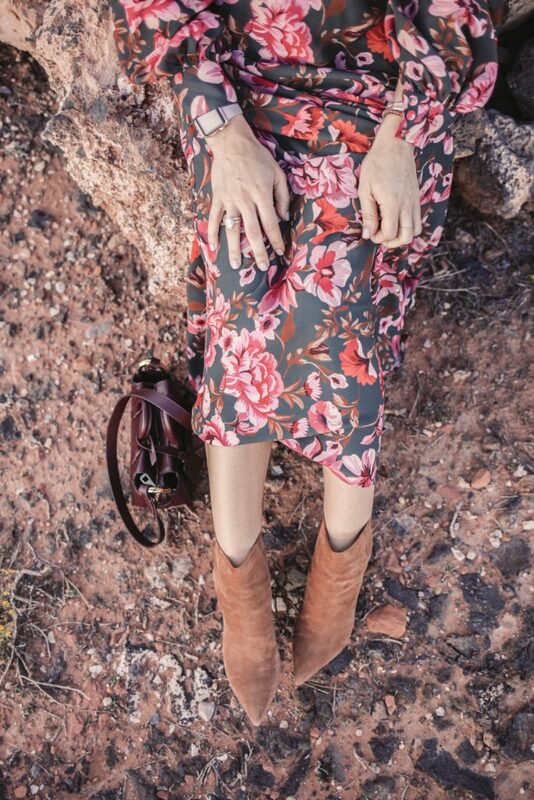 Floral Maxi Dress // This is the maxi dress of my dreams! As soon as I saw it on Rent the Runway, I put it in my car IMMEDIATELY! 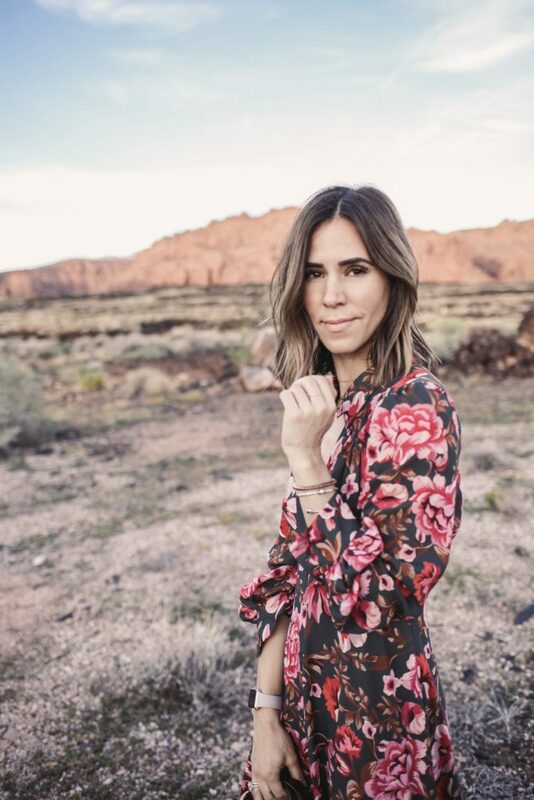 I knew it would be the perfect dress for the St. George backdrop! The pink floral against the army green is absolutely heaven – this just might be the perfect dress for Thanksgiving!! Brown Suede Booties (similar) // If you are in need of the perfect fall bootie, look NO further! These booties from Banana Republic have been my GO-TO bootie this fall! The sleek pointed toe and the detail on the zipper are everything – the best feature…they are SUPER comfortable! The Banana Republic restocks every now and then, but here is a great close second! Thank you to the Red Mountain Resort for your amazing partnership. All thoughts are my own.